American Express UK offers different types of cards in the category of personal cards, business cards, corporate cards and gift cards to meet varied needs of customers. Each card comes with specific features and benefits. They also offer membership and other rewards. 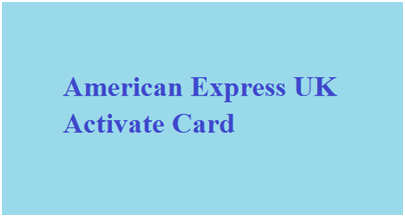 Here we will discuss on steps to American Express activate new card online. Visit the link ‘Create New Online Account’ displayed at bottom of the login window. Enter your American Express 15-digit card number and 4-digit card id in the space provided. Click ‘Confirm’ button. Set up your profile providing information required and complete the process following instructions given. Enter your user id and password in the space provided in login window and select type of the account. Click ‘Login’ button. If you have forgotten your user id or password, click the link ‘Forgot Your User ID or Password?’ link; you will be assisted reset it. Pay the bill providing account details. If you have any question about how to activate American Express UK Card, then you can call customer service at a number mentioned on back of your card. You can also have live chart with them at www.americanexpress.com/uk/contact-us/. For a lost, stolen or damaged card, you can call at 0800 917 8047.